My new job offers the option of working from home or office. Which should I choose? This is a very timely question given the exponential growth of telecommuting. As technology has evolved, some people rarely go into the main office anymore. While it may seem like a no-brainer to choose working from home, there are some drawbacks to consider. Take a look at a few pros and cons before you decide. While it sounds like an ideal situation, working from home will not suit everyone. It all depends on your home environment, your personality and your work ethic. "We've had success allowing our telemarketing staff to work at home," confirms a leading window installation company. Many people thrive on being around their family while working. You'll need to be using cutting-edge communications technology at home, since it's your work lifeline. Remote IT support may be needed for your computer problems, and data protection security issues may arise. In general, IT and security professionals do not view teleworkers as a security risk but you may have to undergo additional training. A defined office space is also highly recommended, working on the couch is not practical. Many remote workers fear they will be left behind in terms of career advancement. You need to have regular face-to-face meetings with management to stay in line for promotion. When surveyed, a third of managers said they prefer to see their staff at work, while 75% said they trusted them to work from home. "In our business of home heating and air conditioning service, it made sense to base employees at their homes, since they are constantly on-call to travel to customers." Working from home typically has more pros than cons. People are desperate to find a balance between work and life and are sick of the daily commute. Two thirds of employees want to work from home and 36% would choose it over a pay rise. A survey of 1,500 technology specialists revealed that 37% would take a 10% pay cut if they could work from home. Almost half of the companies that allow telework claim that it has reduced attrition, and 95% of employers say that it has improved employee retention. Hiring and training new employees is costly and companies want to avoid it. Commuting is a drag, with half of all employees claiming it's getting worse and more expensive. Two thirds would take another job to ease their commute. Working from home reduces unscheduled absences. A whopping 78% of workers who call in sick are not being fully truthful, with family and other issues usually the cause of employee absenteeism. Teleworkers usually continue working when they are sick, without infecting others. 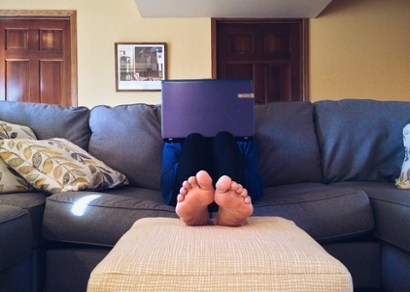 Major companies with teleworking programs have cited between 20% and 45% increased productivity from those working from home. Flexibility is another huge plus, since you can run errands or schedule your work around your life. Company benefits are also substantial with 60% of employers citing significant cost savings due to teleworking. With both parties benefitting in terms of time and money, working from home is a win-win situation providing you have the tenacity for it. When you're working from home and you've got children, a big night out is going to Pizza Express down the road - Jane Green.